You, like many others who have lost their dog are likely to be in a state of numbness. Completely devastated, broken, and confused. Everything seems so much quieter now that the love of your life is gone. You hesitate to remove their toys from between the couch cushions. You stare at the blankets they used to lay on. 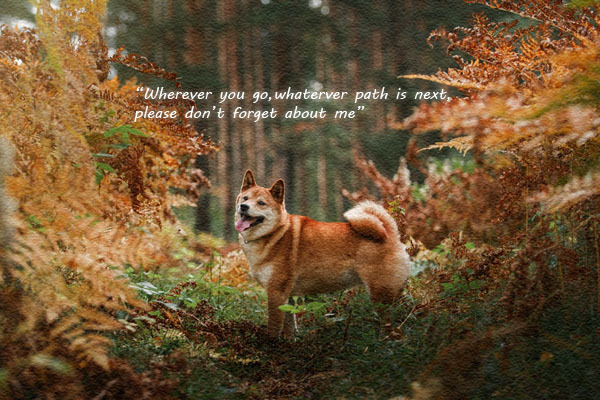 The cherished moments, the daily routine that had been such a part of your norm has vanished in the blink of an eye; and all you have are the memories of when your Shiba Inu was there by your side. Dealing with loss is never easy, whether it is over a pet or a person. When you love someone—truly and deeply—the magnitude of the loss is enough to separate you from everything else that ever mattered. However, while some people may never understand how much your furry companion meant to you, you should never feel guilty or silly about grieving over the loss of your friend. 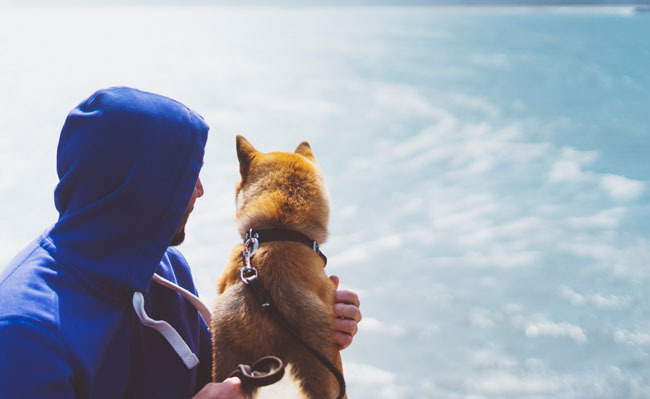 Instead, you can use these coping methods and advice to help you better deal with the loss of your beloved Shiba Inu and begin the process of moving on. Some people grow up with their furry companion and have shared moments with their dog that go beyond what some human relationships ever hope to become. But the honest truth is this: the pet owner never sees their Shiba Inu (or any other pet, for that matter) as “just a dog.” All pets give us a sense of purpose. Dogs are a unique part of our lives. The interspecies bond has been around for as long as humans banded together. Since the dawn of time, humans have received unconditional, nonjudgmental love from their dogs; and so the relationship between man and beast is one of affection, assistance, and loyalty. This might be way humans seek to read emotions in the faces of their dogs and why those very dogs begin to comprehend exactly what their human wants just by looking at them or sensing emotions. This connection is extremely similar to the way humans treat their own biological family. This is especially true if you lived alone with your pet. Since the bond between you and your Shiba Inu was forged through the awkward puppy years, training sessions, long walks, other periods of happiness and sadness, and other defining moments of your life, once they are gone, it truly feels like something essential was ripped away from your very soul. Research has even confirmed that, for most people, the loss of their furry friend is actually comparable to the loss of a human loved one. Depending on the relationship you have with family and friends, you might actually grieve more over the loss of your animal than you would a human. That is why losing a pet hurts so much. Recorded emotional responses include inability to accept the loss of the pet, intense crying, disorientation, insomnia, denial, disbelief, shock, anger, guilt, depression, and feeling like things will never be same and that the pain will be perpetually intolerable. Behaviorally, people react in different ways, too. Wanting to sleep with the blanket your departed Shiba Inu once used is normal, as is being unable to get rid of the animal’s possessions. Some people who were particularly close to their furry companion may even have fleeting thoughts about suicide, but if these thoughts continue or worsen in intensity, immediate intervention is required. Five Stages of Grief, popularized by the 1997 book called On Death and Dying by Elisabeth Kubler-Ross, MD is a good resource that outlines the common stages of grief. The stages below are not meant to compartmentalize emotions and grieving but to help us understand the entire cycle. Some stages overlap or shift position. Denial – Initial shock of loss leads to denial that the loss ever happened. Emotion numbness may ensue as an act of self-defense from the pain. Anger – Reality sinks in. Anger begins to develop as a result of bottled up emotions and frustration. The mourner may seek to place blame on someone or something for the death of their loved one. Bargaining – Also known as the “what if” stage. The mourner will think up things that could have been done to prevent the death or if they had acted correctly. With bargaining comes guilt. 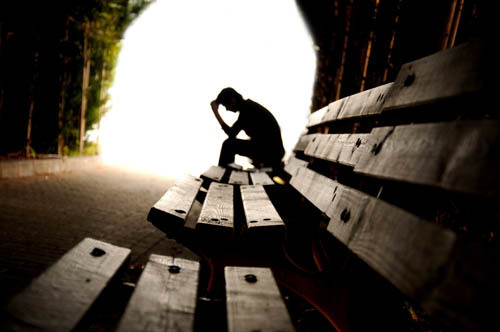 Depression – One of the most difficult stages to endure. The person begins to come to terms with the loss and races the reality that their companion is no longer in this world. Though most people can move on from this stage without assistance, those with records of depression or other mental illness will have a hard time overcoming this hurdle. Acceptance – Reaching the acceptance stages means completely understanding the reality of death. While acceptance does not mean “getting over it,” it does mean that you understand life continues on. The grieving process happens gradually and cannot be rushed. You cannot force someone to grieve, just as you can’t force someone to forget something traumatic. There is no time frame for grief. Some people start recovering after a few weeks. For others, the grief might grip them for months or even years. Be patient with yourself and allow the grief to naturally subside. Ignoring the pain will only make it worse. In order to heal for real, you need to face the grief. Express your grief instead of bottling up the feelings. Oftentimes a pet’s death is accompanied by guilt. You, the friend, family, and guardian of your pet, should have been able to do something to prevent this loss from ever happening. Perhaps, you could have tried harder, spent more money, or changed something to prolong your pet’s life. Through all of this ruminating, you begin to feel like you were unworthy of ever having a pet. This is especially common with owners who chose to euthanize. After your companion passes away, you may imagine second or even third opinions that could have saved their life—even if a second option didn’t exist. In cases where the pet was terminally ill or had a fatal injury, even if treatment had been available, you might have chosen to end the suffering rather than prolong it. You might blame yourself for ending their life prematurely or elongating it unnecessarily. Criticizing and condemning others and yourself for what could have happened is not healthy and can begin to sap other sources of joy from your life. Keep in mind that you did what you could do. Oftentimes, in the moments when you make the decision to euthanize, for example, you forget the reasons you decided to do so. Most of time there is no other choice. Guilt can also stem from accidental deaths, such as your pet getting struck by a car. Witnessing the accidental death could leave you severely traumatized, and you might even develop symptoms of PTSD alongside the guilt. An animal that loved you would never want you to suffer. Think about all the times your pet consoled you and know that they would empathize with your sadness. 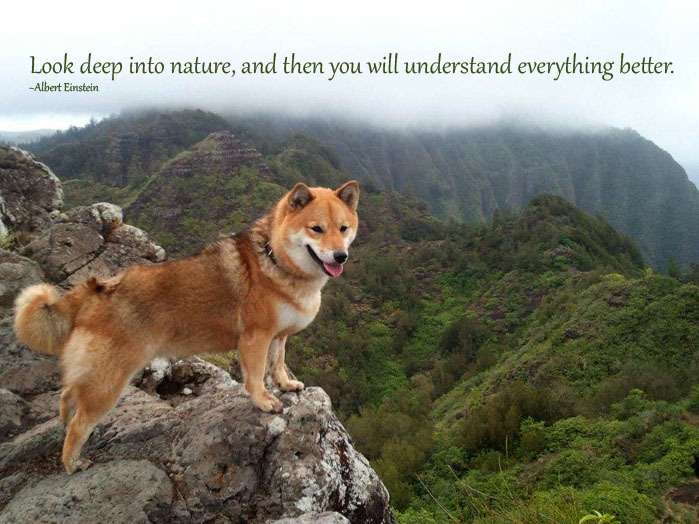 Without a doubt, no Shiba Inu would want their human to live the rest of their lives depressed. Every dog wants their human to be happy. That’s just what pets are—perpetual rays of sunshine, even when they are gone. In the event that you are feeling extreme feelings of guilt about the death of your Shiba Inu, you may want to seek professional help. Many communities (even online ones, like betterhelp.com) have mental health centers and grief counseling groups available whenever you need to talk to someone. 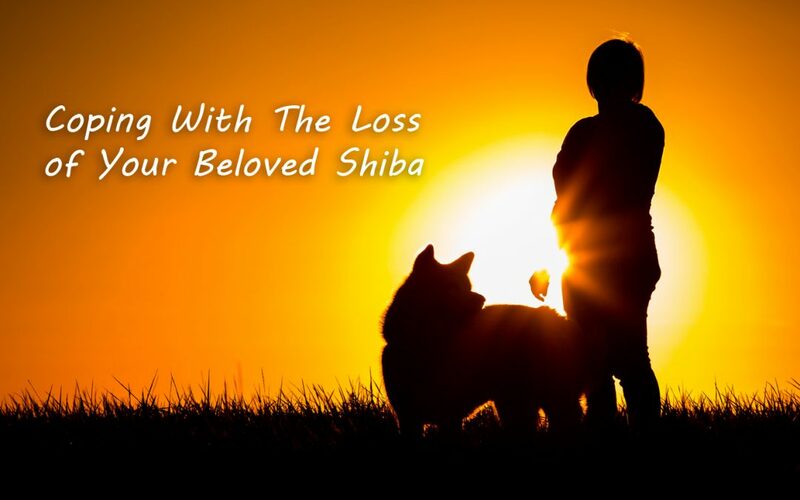 Don’t let the guilt keep you from remembering the time you spent with your beloved Shiba Inu. Grief is a journey and never a well-defined path. You might experience the Five Stages of Grief or not at all. For the period that you are grieving, though, there are a couple of things you can do to make the process less difficult. Turn to your faith for comfort, reassurance, and peace. It helps to understand that deep beneath all of the heavy physical layers of life's trials and tribulations - there must be a meaning and purpose. There has to be a "bigger picture". Without this belief and hope, many would find that their journey through life is quite pointless - especially for the suffering and weary-hearted. Hope is the one thing that can soothe and mend a shattered heart. 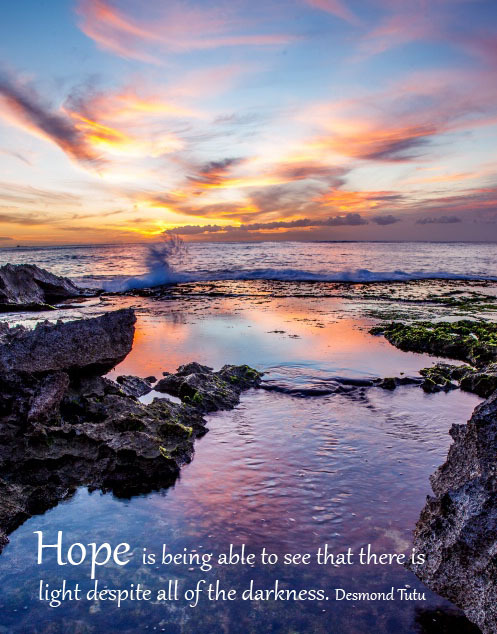 And spirituality is by the far the best way to strengthen and renew your hope. Yes, it is going to be complicated finding your "new" normal. The grief will inevitably have an impact on your home and social life. Focusing on everyday tasks will be difficult, and cycles of “what-if” thinking may interpret moments when you need to concentrate or solve problems. While it is perfectly normal to have these moments, it is also important to try and distract yourself from time-to-time. You can even pair these distractions with active moments of grief. For example, you might go to the park where you and your Shiba Inu used to take walks but instead notice the new lilies on the pond or the children playing in the field. You might choose to eat the food that you used to share with your Shiba Inu but instead have a mindful practice, focusing on texture, scent, and taste instead of sadness. Healthy distractions should be akin to laughing over a cup of coffee with a good friend or enjoy the sunrise. Even if these distractions are small, the brief moment of joy will rekindle that light in your soul. All though the saying is completely overused, it is true - time will eventually heal. Though it takes time, acknowledging the reality of the death is a vital piece of grief. Yet, that moment when you can finally say that you accept your Shiba Inu is gone is different for everyone. There is no marked day on the calendar. One day, whether it is a week or several years after your companion has passed, you will be able to say that you are prepared for life without them. When this happens, you will still experience moments of sadness and pain. You will still miss your Shiba Inu. Of course you will. The sadness, though, will now be coupled with happy memories. Knowing that this day will come, you can continue to push through the sadness to a new light. Losing a beloved pet brings with it heartache and depression. People will feel and express their pain in a number of ways. One thing that should not be done, however, is pushing this pain away. Those who put a stopper on the grief will end up creating a volcano of depression inside themselves. Eventually, you won’t be able to tolerate the unspent emotions any longer, and this can be a dangerous development. Instead, engage the emotional thoughts. Understand where the sadness is coming from and recognize that it needs to be tending to in its own way. Just as you sterilize a cut and put a bandage on it, you are going to have to figure ways to dress up this grief and ease it. Even when the living pet is gone, they are not completely erased from our lives. 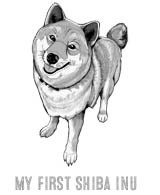 Memories and other mementos will immortalize your Shiba Inu for as long as you are alive. Tell the stories that were the highlight of your time together. A lot of people ease through grief by creating some kind of legacy or memorial for their furry companions. Sometimes, you might order jewelry or tapestries that have your pet’s visage; or you might commission artwork to be done of them. Creating a miniature home movie featuring pictures and video taken throughout your Shiba Inu’s lifetime. Some people report that without their companion, they don’t know who they are anymore. A lot of self-identity is tied to your animal, especially if this is how people connected with you. For example, the kids in the neighborhood might refer to you as “the person with the fluffy fox-dog.” Now that your dog is no longer by your side, you may have to rethink who you are. Second, you might begin to question the meaning of life and the purpose of having pets if all their death brings is repeated pain. Part of the grief process is addressing these questions and reminding yourself that your Shiba Inu gave you happiness and friendship and love. Though concrete answers to your questions don’t exist, you will eventually come to understand why you brought your companion into your life to begin with. You should never let anyone tell you how to feel about the loss of your pet, nor should you tell yourself how to feel either. You don’t have to force yourself to be optimistic if you don’t want to be. You don’t have to smile for anyone else. If you’re going to do it, it better be because you feel happy. Your grief belongs to no one else. No amount of people telling you to “move on” and “get over it” is going to make the upset subside. It’s okay to get angry, to be frustrated. You are allowed to cry. But you are also allowed to laugh, seek out moments of pleasure and joy, and to let go when you think the time is right. You might feel the need to defend yourself, but never argue with people who are arguing with you about your grief. Your grief is appropriate, no matter what others say. 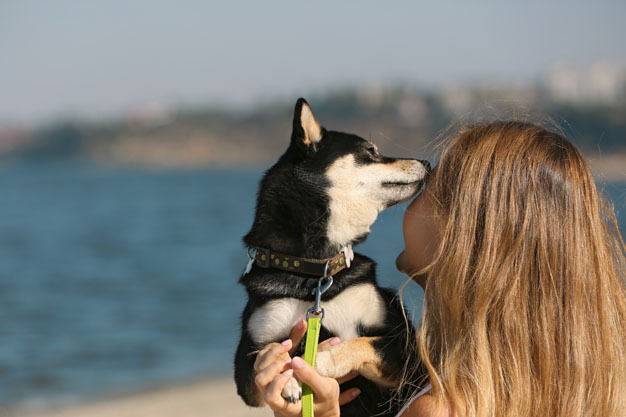 Family and friends might not have appreciated the connection between you and your Shiba Inu as much as you did. When this happens, it is perfectly acceptable to seek help outside of your immediate social circle. Seek out others who have lost pets. They will understand the gravity of your loss and can commiserate. Losing your dog means that a chunk of your daily routine is going to also end. The stress of this change can deplete your energy and emotions. It is important to look after yourself, physically and emotionally. Be sure to get plenty of sleep, exercise regularly, and eat a healthy diet to ensure you are burning off the stress in a beneficial way. If you have children and or dependents, you can't let your grief cause suffering to them. Surviving pets will also experience the loss and may become distressed. Try to maintain a daily routine so that these surviving companions are not harmed. Plus, devoting time to the remaining pets will help boost your mood as well. While you might be affecting by the passing of a pet, others might be suffering as well. Senior citizens and children are particularly susceptible to trauma from death. Rather than shielding these individuals from sadness or trying to discourage them from feeling lonely, confused, and depressed, involve them in the grief process as much as possible. Older adults who lived alone with their pets will need additional attention so they do not succumb to loneliness. Rainbow Bridge poems can bring comfort to grieving pet parents. Some people will find the idea that their pet is waiting for them in the afterlife tremendously soothing, especially if they are religious or spiritual. However, only talk about the Rainbow Bridge once you are absolutely positive the person not only is okay with this concept but has also received another form of sympathy. Simply giving someone a Rainbow Bridge card without knowing the person's belief will only show that you do not the grieving person very well. Tell the person who is grieving over the loss of their pet that you are there for them, whenever they might need your support. Knowing that will do much more good than a sympathy card ever will. How many do you know who have lost an animal and almost immediately go out and adopt another? Indeed, the motivation and timing required to bring another companion into one’s home is a very personal decision. There is actually no right or wrong moment when an owner should be faced with the possibility of introducing another animal into their life; however, one thing you have to keep in mind is your current level of grief and whether or not you are working through it in a healthy manner. Never adopt a new dog if you are unable to look after yourself first. On the same note, you should never give a grieving person another animal as a way to make them feel better about the loss. This could actually exacerbate the feeling of grief, and they might neglect their new companion as a result. 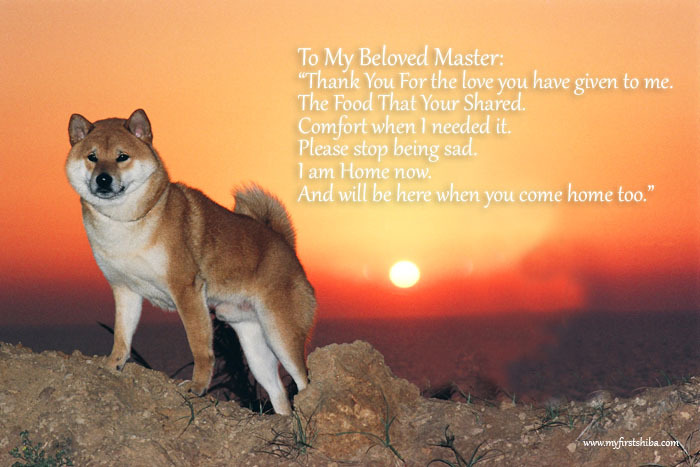 The most important thing to take away from this guide to dealing with the loss of your Shiba Inu is that grief takes time. 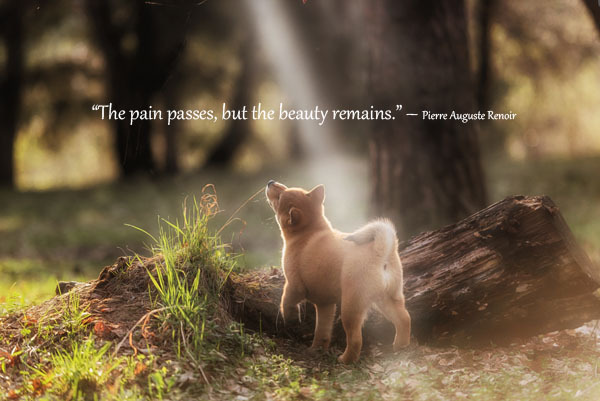 Many of us who have had dogs, especially Shiba Inus know what you are going through. 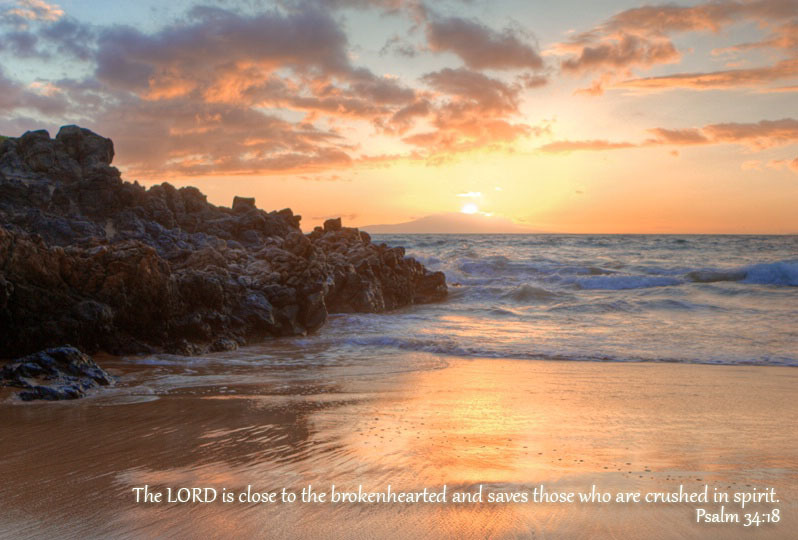 We know the throbbing feelings of hurt and sadness emanating constantly from your heavy heart and chest. It hurts to breathe. And we do want you to heal. A lot of things will change know that you and and your companion have parted ways. The cyclic nature of life and death is a both a beautiful and sad reality of our current existence. The sadness extends to the fact that we just don't know if we will one day be reunited with our beloved pet. So take all the joy of past memories along with a renewed sense of hope and keep marching on.